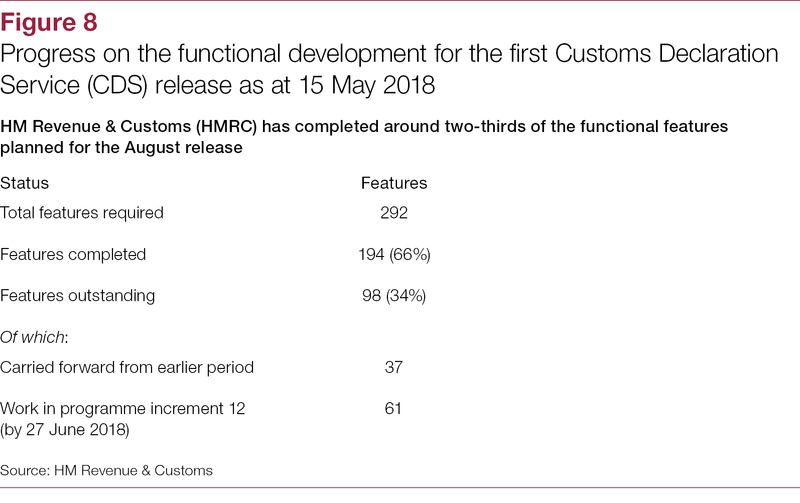 HM Revenue & Customs (HMRC) is now in the final year of its programme to replace its existing customs system, CHIEF (Customs Handling of Import and Export Freight), with a new Customs Declaration Service (CDS). 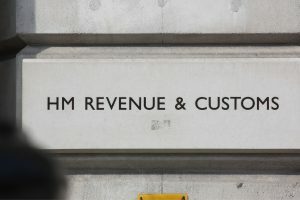 HMRC is changing its customs system to comply with legislative requirements that were established before the UK voted to leave the European Union (EU). The new system will be an integral part of the UK’s overall customs regime. 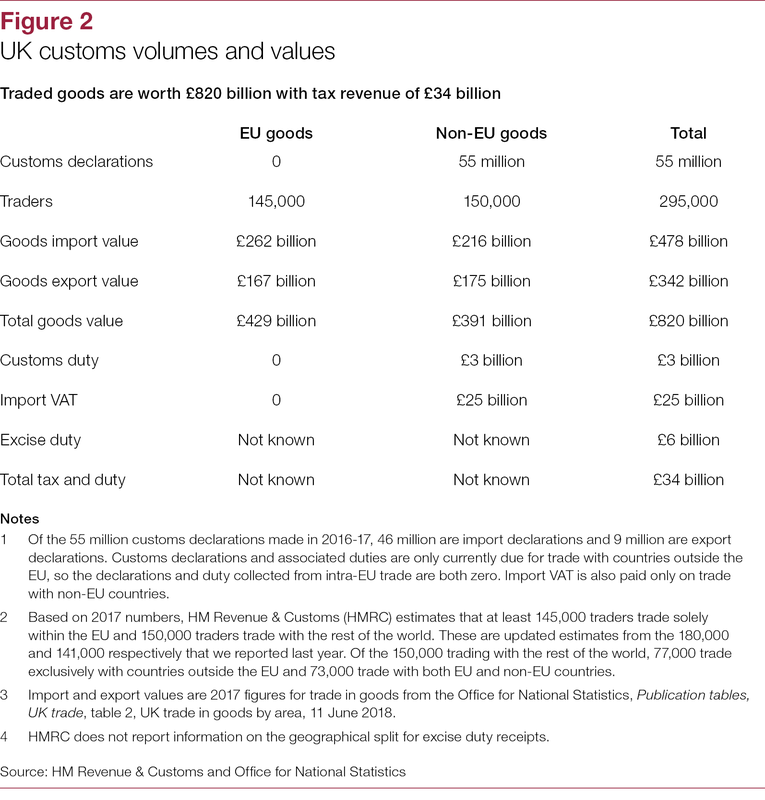 The UK collects around £34 billion annually from customs and excise duties and value added tax (VAT) on transactions at the border. In 2017, around £820 billion of goods crossed the border. It is vital to the UK’s economy and consumers that trade continues to operate smoothly across the border, for example by maintaining the trade flow of perishables such as food products. 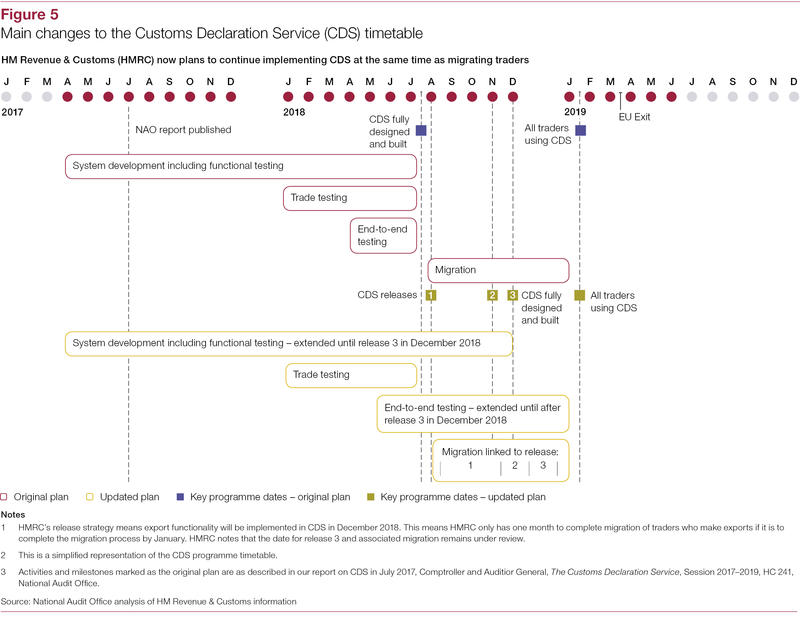 The UK’s decision to leave the EU and the customs union has important implications for the CDS programme. 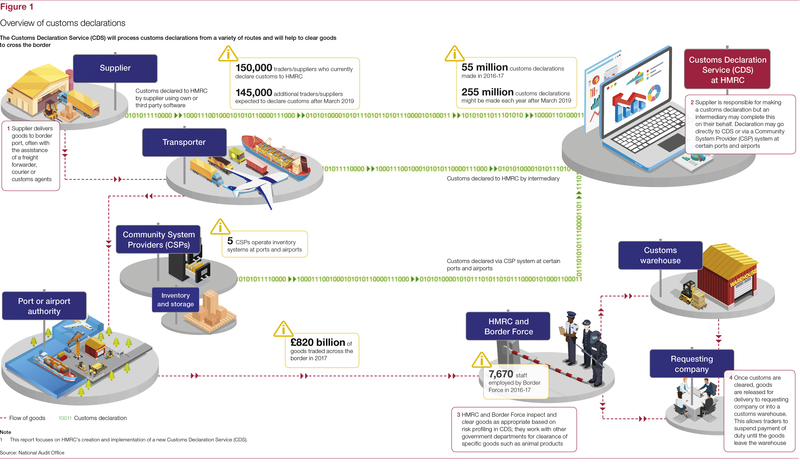 Depending on the outcome of EU exit negotiations, from March 2019 at least 145,000 traders who currently import or export goods solely within the EU might be required to make customs declarations for the first time; and the number of customs declarations could increase from around 55 million to around 255 million each year. This report provides an update on HMRC’s progress since July 2017. 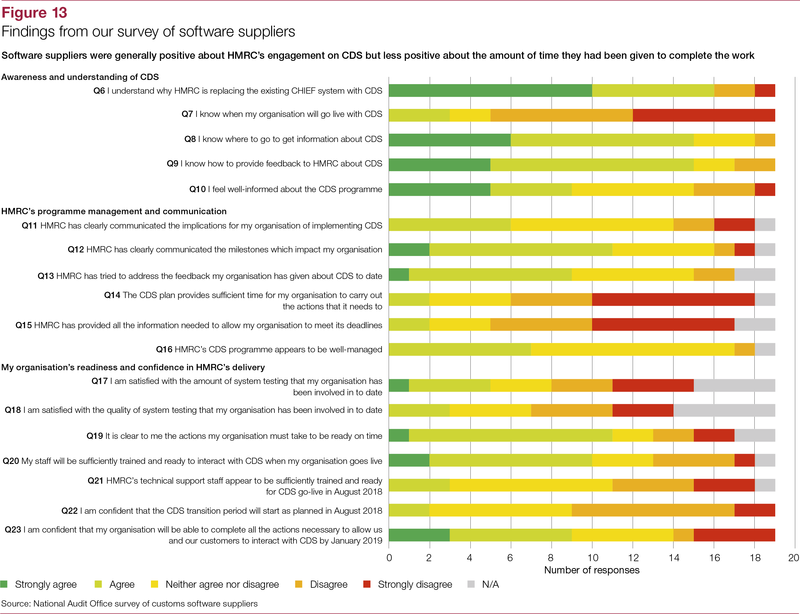 We consider the deliverability of the CDS programme and highlight the risks and issues HMRC needs to manage to fully implement CDS by January 2019. 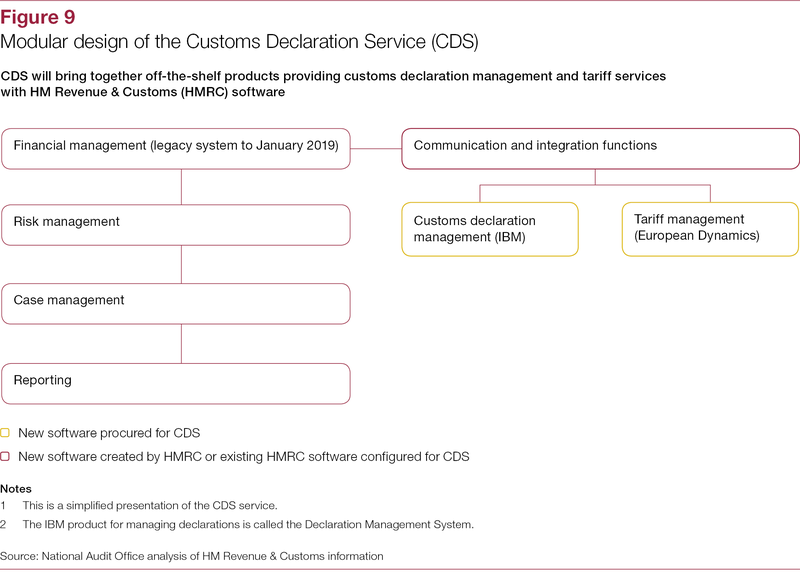 We also consider what HMRC’s progress with CDS and its contingency option means for the risks associated with being unable to process customs declarations at the volume required in the event of ‘no-deal’ with the EU. As in our previous report, we do not evaluate the overall value for money of the programme. 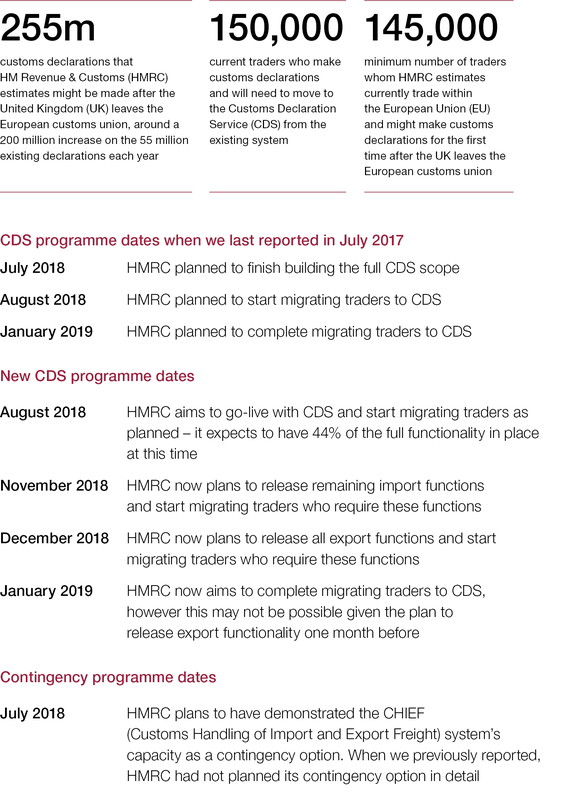 We review how HMRC is managing the CDS programme; HMRC’s progress in meeting the technical challenges of implementing CDS and creating a working contingency option; and HMRC’s actions to ensure that traders and others involved in customs administration are ready to use CDS by January 2019. 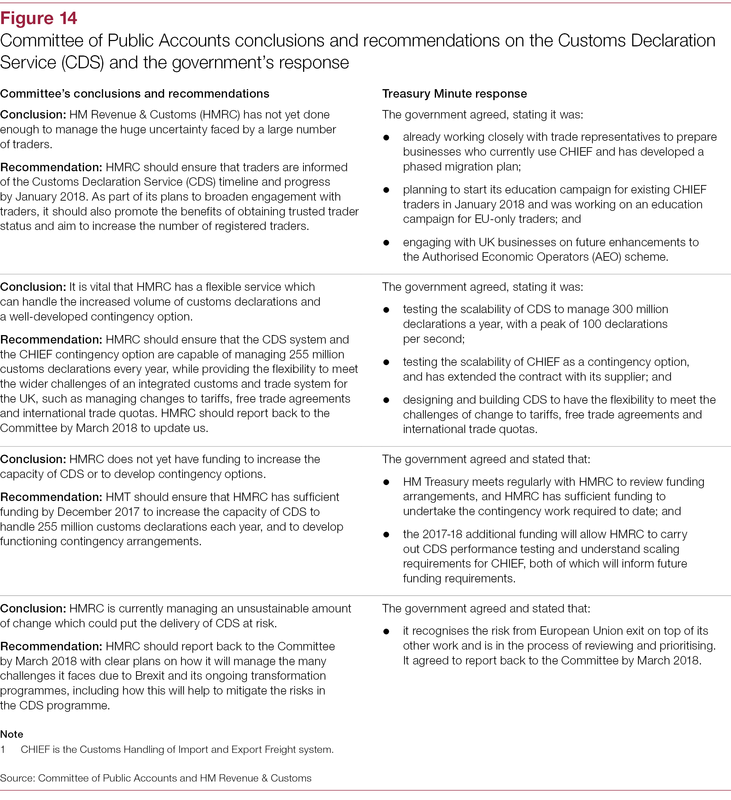 This report does not cover aspects of the government’s overall customs regime that are outside the CDS programme. 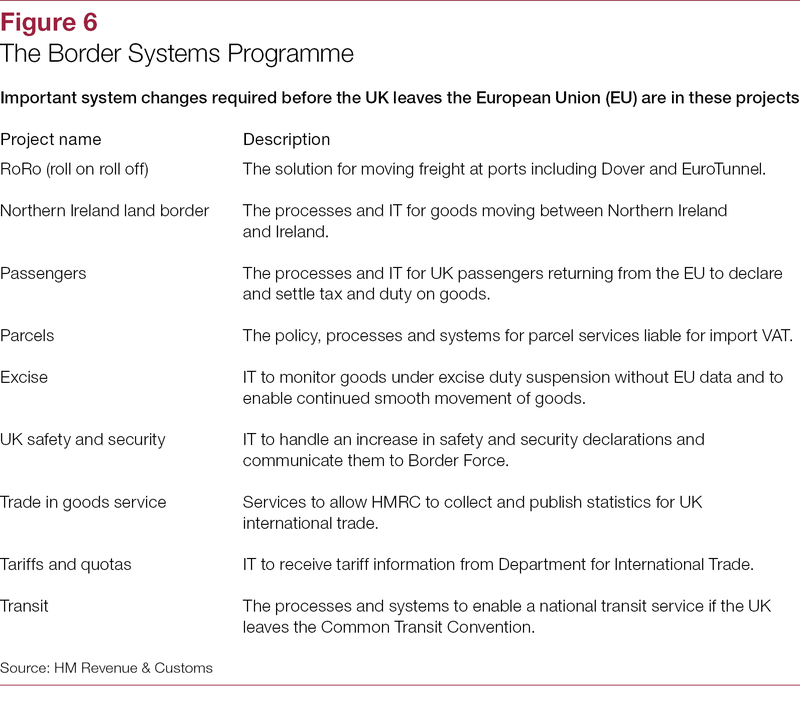 In particular, we have not included Border Force, which controls the movement of goods, people and transport at the border, and the work of other government departments and agencies; and wider changes to border systems, infrastructure and any requirements for new staff resources. The UK and EU have made progress towards an agreement that will leave customs arrangements unchanged until December 2020. However, until this agreement is confirmed, the government has directed HMRC to continue planning for a ‘no deal’ scenario with the expectation that a fully scaled and operational customs system will be in place in March 2019. In response to the concerns we highlighted in July 2017, HMRC has accelerated its plans to develop the existing CHIEF system as a contingency option. This has reduced the risk that it will not be able to handle the potential increased volume of customs declarations at the end of March 2019, in the event of ‘no deal’. The contingency option is still to be fully tested, and the success of customs preparations will involve many other dependent systems and processes at the border. 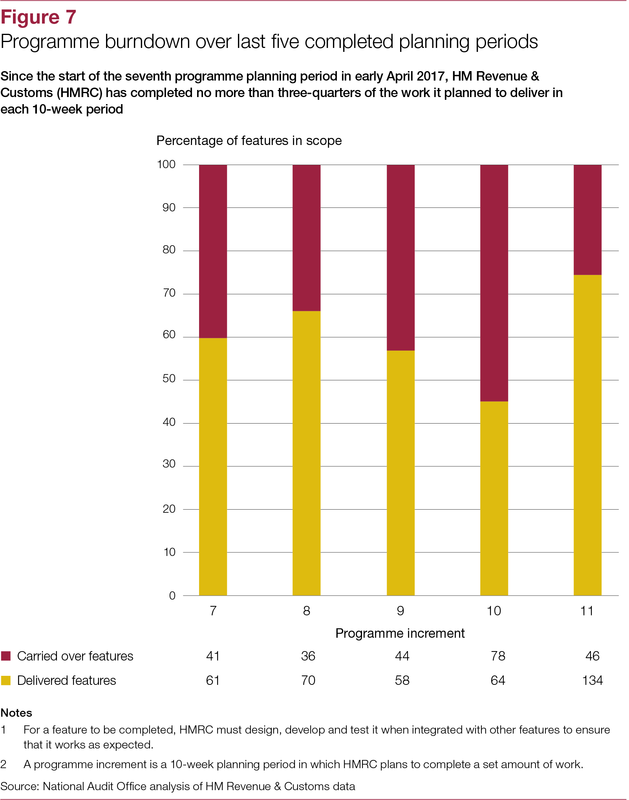 However, if HMRC completes this work successfully, it will be in a better position in the event that CDS is not ready or does not perform as planned. 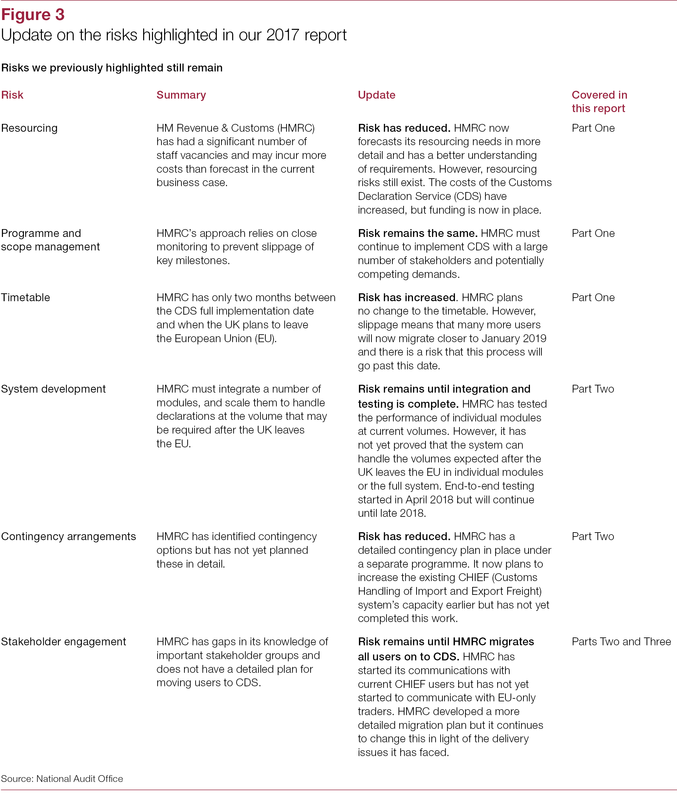 Since July 2017, HMRC has taken steps to mitigate some of the risks we previously highlighted. However, further technical and business issues have arisen in the CDS programme, and an already tight timeline has become even more demanding. Significant challenges remain and there is a risk that CDS will be unable to fully replace CHIEF by January. 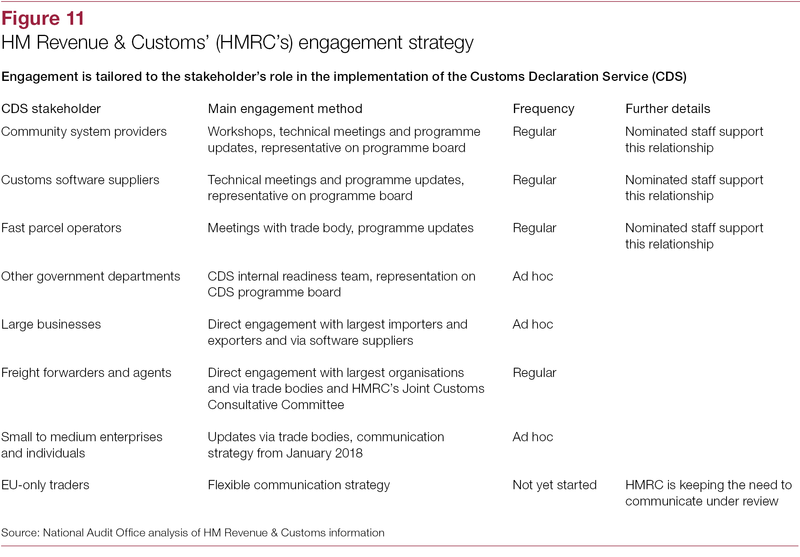 HMRC has mitigated some of the risk with its plans to operate CHIEF and CDS in parallel over this period. 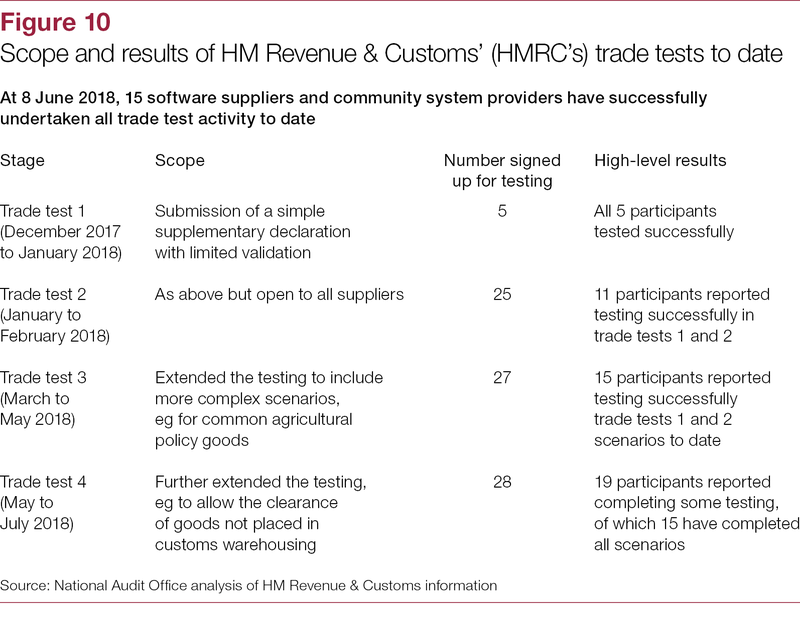 However, it is also critical that HMRC fully tests and scales-up its contingency option over the summer of 2018, supports delivery partners such as CSPs and software providers to make necessary changes to their own systems, communicates effectively with traders about new customs processes and migrates them successfully on to CDS.